We have a dedicated pastoral care (child welfare) team on-site all day and night on every camp. 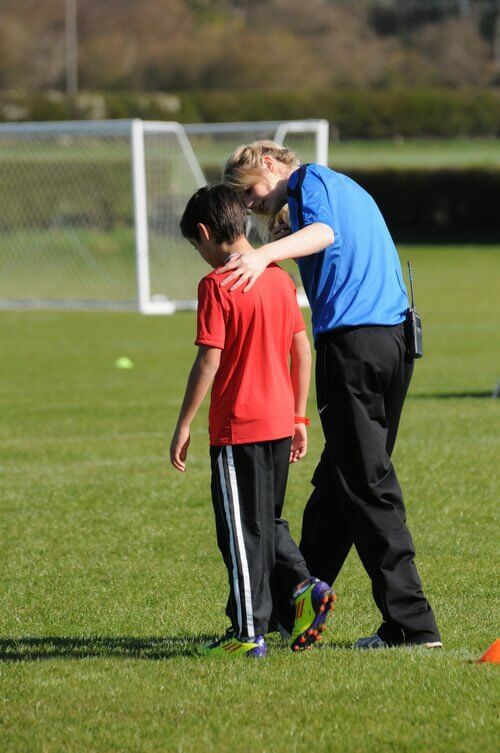 Their job is to ensure the safety and well being of every child, both physically and emotionally as well as assisting with the basics like getting players to sessions on time and with the right kit and equipment and ensuring they get enough sleep. Our pastoral staff are carefully selected and well-trained, using our years of experience to pick the best people for the job. All staff have an enhanced DBS check (a background check to ensure they are suitable for working with children) and are trained in child safeguarding. All senior pastoral staff have extensive experience working with children, usually in school or summer camp setting. It’s natural that during the first few days of the camp some players get homesick. Our staff are trained and experienced in identifying signs of homesickness and offering support and comfort. As players settle into the camp and get involved in camp activities, homesickness usually subsides. Excessive contact with home during the first couple of days at the camp can make homesickness worse so we encourage parents to help their children become more independent but will work closely with parents to ensure the best experience for every child. Our staff are also trained to identify any emotional changes or abnormalities in a players’ behaviour and will ensure they are fully supported to overcome any issues and make the best of their time with us. We operate a phone ‘bank’ system on every camp. Players give in their phones and valuables to the camp bank for safe-keeping. This is mandatory. Then each evening during free-time players can access their phones to call home and catch up on messages. They return their phones to the bank before they go to bed. Although we will always wake players up in the mornings, some players like to know the time when they’re in their bedrooms so we advise bringing a watch or alarm clock in this instance. This system ensures phones don't get lost during sports sessions, distract players during English or keep them up at night. It also makes for a great social camp atmosphere encouraging interaction and new friendships. On all of our camps there will be some kit or equipment that children are required to wear or use during their sessions. A full packing list for each sport/venue is available in the Parent Information Packs. Vital kit includes things like shin pads for football, proper footwear and of course a racket for tennis. Additionally players should bring ample sports kit, clothing for wet weather and heat, swimming kit, towels, a laundry bag, UK plug adapter and an alarm clock if desired. Every camp has free laundry facilities available on-site but we ask that players attending a 6-night camp bring enough clothing to last the camp. 13-night campers will be able to do laundry on the middle weekend of the camp. We often get asked how much spending money players should bring. As everything is included in the camp, players can get by without spending money but there is the opportunity to buy additional snacks on-camp (cash only), and to buy souvenirs and extra food on trips. Players tend to bring £50 - £200 or a UK-activated credit/debit card (depending on their age). All cash will be kept in the camp bank, with the exception of small amounts for snacks on-site. This is just a guide, there is no requirement to bring spending money. Please note we are unable to arrange for additional spending money to be provided to players through parents calling our office and paying by card. Please ensure you supply your child with sufficient funds before the start of the camp. There is a Sports Therapist on-hand during sports sessions in case of injuries. They will assess and treat minor injuries on site, and will be available at other times of the day to offer support and advice. Parents will be informed of any serious injury that prevents players from participating in sports sessions. If any injury requires specialist medical attention the player will be taken by our staff to the nearest hospital or doctor’s surgery. All our venues are within 30 minutes of a hospital. In the unlikely event of a serious injury a player will be taken to hospital immediately. Our coaches use extended warm-up and cool-down exercises in every sports session help to minimise the risk of injury. If a player has sustained an injury prior to the camp but is able to attend, please inform us in writing prior to arrival and preferably advise what is the medical diagnosis, if you have received one. Alternatively, you can brief one of our staff on arrival at the camp. The sports therapist will assess the injury on the first day of the camp and offer advice. All staff will be notified of the injury so they can monitor any changes. We take all injuries seriously and we recognise that some young players will want to play with their injury even if it is causing discomfort. Our Sports Therapists will evaluate injuries on a twice daily basis and we follow their recommendations on whether a player should or should not play. This decision is taken in the long-term interests of the fitness of the player. We have senior pastoral staff at each camp who are trained in first-aid and in the administration and dispensation of medicines. Please make sure that we understand what medicines your child requires and in what dosage and frequency. They will contact you if your child is unwell and unable to participate in activities to discuss the best course of action. They will also take your child to the doctor or hospital if necessary. If your child is taking medication when they start the camp, our staff will assist them to do so and keep their medicine in a safe place. The Player Welfare Form you complete before arriving will ask about medication but you may be asked again when you arrive at the camp to ensure the information is up to date. If you would like your child to share a room with a particular person, you can request this in the Player Welfare Form after making your booking. However, this person must be the same gender and the players must be less than 2 years apart in age. We organise the camps in age groups so that each player gets the best out of their camp experience. Unless you have a room-share request, players will be roomed with others (often only one other) of a similar age (within 2 years). They may or may not speak the same native language. New trainers, particularly in the summer when the ground is hard, can cause blisters. If your child has new trainers we advise to ‘wear them in’ before the camp starts, to avoid the risk of blisters. We can treat blisters, along with any other minor injuries – abrasions, strains and bruising. We check players are eating and drinking enough at each mealtime. Water is always available during sports sessions and coaches ensure players regularly re-hydrate. We also talk to the players about the importance of nutrition and hydration in workshops and throughout the camp. Meals on our camps are nutritionally balanced and designed for young athletes. We provide a variety of meal options to choose from, including a vegetarian option. We teach and monitor each player to ensure they are eating and drinking enough during the camp and our coaches ensure players drink lots of water during training sessions. We primarily group our players depending on age so they are all able to receive the best coaching experience possible. We understand that players coming to our camps may want to be in the same group as their older siblings or friends, but we believe this grouping policy gives each player the safest and most appropriate coaching for them to develop as players. Our English classes are grouped by students’ English language ability and age. These classes are formed after each player has completed their short language test. We understand that for some of our players, being away from home can be a little stressful to begin with. This is only natural. All our experienced staff are fully trained in identifying and dealing with players who are worried about being away from home. We believe that the majority of players will settle in and love their time on camp after a day or two of meeting new friends and taking part in lots of fun activities! Therefore, we do ask that you keep contact to camp minimal, especially during the first 3 days – but we will of course inform you if there are any persistent issues that occur. We will also pass on any personal messages that you can send to us via email. A senior member of our staff is always available should you wish to contact us to ask about your child. Whether you are a professional sports person or a player at our camp, you are expected to do your best both on and off the sports field. Our camp regulations and behaviour policy are designed to ensure that each player is safe and enjoys their time on all of our camps. YOU CAN VIEW THE CAMP POLICIES HERE. We respond quickly to issues of fighting, verbal and physical intimidation or persistent bad behaviour. Our camps also provide a professional sporting environment and therefore the use of alcohol, tobacco and drugs are strictly prohibited.